The Insider | Ancient symbols in modern medicine: why? ANCIENT SYMBOLS IN MODERN MEDICINE: BUT WHY? Does the ancient symbolism employed by the institutions that control modern medicine reflect the influence of secret societies such as the Freemasons? In order to fully understand the esoteric significance of modern medical symbolism, such as the cross, or Ankh, or the serpents and staff of Moses, or the winged staff of Hermes, it is helpful to begin by understanding that all doctors swear to pagan gods. The Hippocratic Oath, which is sworn by all doctors, begins with the invocation: "I swear by Apollo the Physician. By Aesculapius, Hygela and Panacea, and I take to witness all the gods and goddesses..." Dr Robert Orr showed in 1993 that 100% of American medical schools administer some form of the Hippocratic Oath to graduates. Dr James Appleyard, Chairman of the World Medical Association's medical ethics committee, supports the modern use of the ancient Hippocratic oath as "the continuation of a statement of fundamental ethical principles that could be affirmed at graduation by doctors worldwide". The World Medical Association's logo features a serpent wrapped around a staff, the symbol of the ancient Greek god Asklepios. Aesculapius, worshipped by the Greeks as the god of healing, who originated in ancient Egypt as Imhotep, high-priest, sage and minister to the pharaoh, Zoser. It is significant that this symbol is reminiscent of the Staff of Moses. The World Health Organisation's logo also contains the ancient religious symbol of the serpent and staff, which is superimposed over the United Nations emblem. In fact, the medical establishment is steeped in ancient religious symbolism. The British Columbia Medical Association coat of arms includes the Rod of Aesculapius, a golden griffin where the substance represents alchemy, a medieval knight's helmet, and an ancient Egyptian Ankh (Crux Ansata or Handled Cross). The Insider approves of their official motto: "Always seek the truth." Paramedics also use the symbol of staff and serpent in the internationally recognised paramedic symbol, also called The Star of Life. The resemblence between this sign and the early Christian symbol of the Pax Christi (Chi-Rho), a cross-like monogram for Christ in ancient Greek, may be significant. 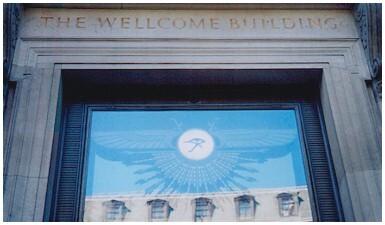 The Wellcome Trust, a major medical charity, employs the winged staff and snakes of Hermes as their official logo, and for no apparent reason there is a huge image of the ancient Egyptian religious symbols of the Udjat eye of Horus and the Winged Disc of Ra, etched into the glass above their entrance opposite Euston train station in the West End of London. The winged sun disc is an ancient symbol for the sun god, Ra. 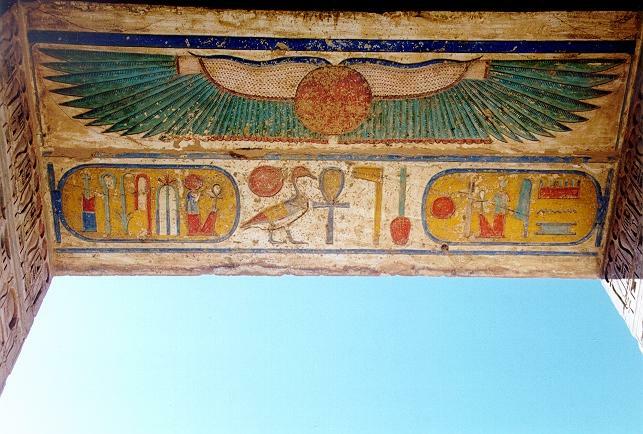 Well known examples of the winged solar disc symbol can be found in ancient Egyptian temples, for instance over the entrance to the Solar Temple of Amen-Ra at Karnak, or or over the Temple doorway in Medinet Habu on the West bank of Luxor. The Royal Society of Medicine coat of arms features the serpent of Moses on a Tau cross, and flowers which resemble the stylised Lotus frequently depicted in ancient Egyptian art. In this discussion about secret societies and the modern of ancient symbols it is pertinent that The Royal Society - the foremost scientific institution in the U.K., was founded by a prominent Freemason, Sir Robert Moray. John Robinson explains in his popular book on Freemasonry: "When Freemasonry came public in 1717 ... it appeared that the Royal Society was virtually a Masonic subsidiary, with almost every member and every founding member of the Royal Society a Freemason." An article in the leading Masonic magazine, Freemasonry Today, echoes this and mentions that "many masons were also members of the Royal Society". The Royal Society remains associated with British Freemasonry today. 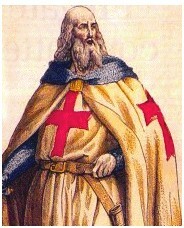 The Red Cross was first associated with human welfare and medical help during the medieval crusades, when European Knights travelled overseas to help pilgrims and foreigners alike, such as the Knights of St John, the Knights Hospitaller, and the Knights Templar which was the first organisation to officially adopt the red cross symbol. The Knights Templar has been operating in secret for centuries, and traditions and inner mysteries are connected with those of the secret society of Freemasonry. 1. The Hippocratic Oath, from the Junior Doctors Association website. 2. Orr RD, Pang N, Pellegrino, EJ, Siegler M., 1997. Use of the Hippocratic Oath: A review of 20th century practice and a content analysis of oaths administered in medical schools in the U.S. and Canada in 1993. Journal of Clinical Ethics, 8(4):377-388. 3. World Medical Association website, press center, statement of support for the Hippocratic Oath. 4. World Medical Association's official logo. 5. Exodus (2 Moses) 4:2-3, & Numbers (4 Moses) 21:8-9, Christian Bible or Jewish Torah. 6. World Health Organisation, official website. 7. British Columbia Medical Association's coat of arms on their official website. 8. Paramedic symbol from a major paramedics website. 9. History of The Star of Light, North Virginia Emergency Medical Services Council website. 10. Examples of Christian religious symbolism, Gospel Facts website. 11. Irish Emergency Ambulance Service website, see Ambulance History page for information about ancient religious symbols used in modern medicine, such as the Rod of Asclepius and the Caduceus. 12. Royal Society of Medicine coat of arms, featured and explained on their official website. 13. Lecture on The Royal Society, by the author and Freemason Robert Lomas, on his official website. 14. J. J. Robinson, 1990. Born in Blood: The Lost Secrets of Freemasonry. New York, USA: M Evans & Co.
15. An article from the official Masonic magazine, Freemasonry today, posted on their website. 16. The History of First Aid, on an official St. John's Ambulance website. 17. Knights Templar History website. 18. An official Knights Templar website. 19. Knights Templar page on the official Indiana Masons website. 1. J.S.M. Ward , 1940. Freemasonry and the Ancient Gods. Montana, USA: R A Kessinger Publishing Co.
*** HIGHLY RECOMMENDED *** One of the most revealing publicly available sources about the Craft, since the 1940s this has been the benchmark reference textbook for research into the relationship between Freemasonry and religion.